Do you still remember the song " Sweet Disposition " from Movie " 500 Days of Summer " ? I know you do miss so much songs like "Trembling Hands" " Love Lost " and " Fader ". It was a good few years for The Temper Trap. The most exciting thing is that they are having their first visit to Taiwan. (No.12, Songshou Rd., Xinyi Dist., Taipei City ). The ticket sale will be launched on Jan 21st (Sat) at 12:00 PM @KKTIX. You could purchase tickets on KKTIX website (if you don't live in Taiwan) and Famiport Machine at Every Family Mart ( If you do live in Taiwan ). The Temper Trap will invite " 88 Balaz " as special guest, Don't Miss It. 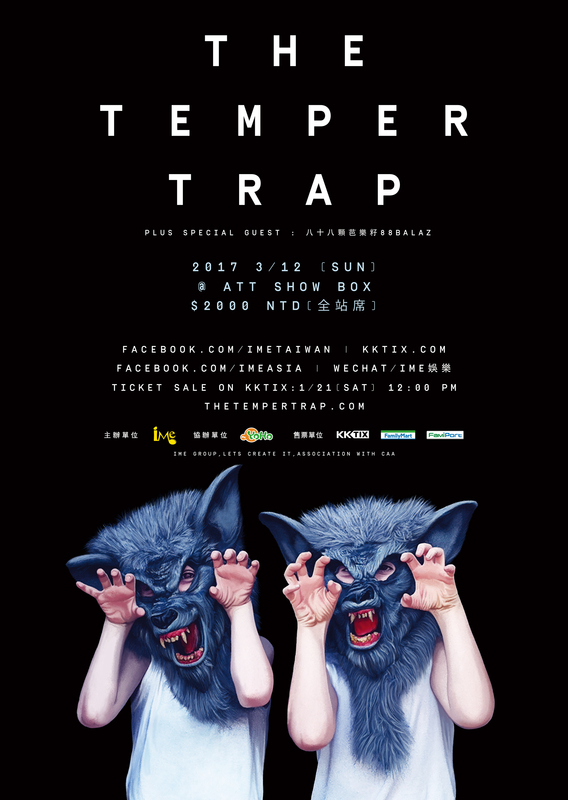 Let's have the unprecedented "The Temper Trap " in Taipei all night. More Information , please like IMEtaiwan on Facebook. Photography and video recording is strictly prohibited during the show. Please do not bring folding chairs or any kind of height-adding device. LED lighting board, selfie stick, large-sized cheering materials are forbidden. Cheering materials which size is bigger than paper size A3 are not allowed. Children under 6 years old are not allowed to enter standing zone. You may purchase up to Six (6) tickets per order. All tickets are all standing. Entry order based on ticket serial number, queue info please visit IMEtw Facebook. It is strongly recommended that do NOT use Yahoo or Hotmail as your email address in order to avoid having Order Confirmation Email incorrectly categorized by Yahoo or Hotmail as spam. Up to Six (6) tickets per order. Wire Transfer by ATM: Order past due WILL be cancelled and seats will be NO longer reserved for you. FamiPort: pick up your tickets at any Family Mart in Taiwan nearest you and pay your $30 Shipping and Handling Fees per order at the counter in Family Mart. You may pick your tickets in Family Mart starting the day after the onsale day and any time before show time. Up to Four (4) tickets per order. Please note that you ONLY have 10 minutes to pay for the tickets at the counter in Family Mart after the payment slip is printed out via FamiPort Kiosk Machine. Once the payment slip is past due, your order will be cancelled and your seats will be NO longer reserved. Your order is NOT completed until you pay the tickets at the counter in Family Mart. Payment slip is NOT the ticket and admission with the payment slip is NOT permitted. 10 % handing fee is required for refunds or exchanges for tickets. We can't refund or exchange ticket after 2017/3/1. Please click here for more information. Please do NOT purchase tickets from any scalpers. KKTIX and the Organizer are NOT responsible for any tickets purchased other than KKTIX website and Family Mart. Children under 6-year-old is NOT allowed for this event. Please keep your tickets in a safe place. If your ticket is lost, stolen, damaged, or destroyed, please contact KKTIX Customer Service Center at +886-2-25770362 or support@kktix.com. Camera, video/audio equipment, gopro or iPad type devices are not permitted at the concert. Unauthorized recording and/or photography, including live streaming of the Concert, is strictly prohibited and may result in ejection from the Venue and such recording or photography files will be deleted. The organizer reserves the right to make changes to the event program. If necessary, changes may be made to its content, method and organization before or during the event.